This is the chocolate tree, Theobroma cacao also known as the cocoa tree. The fruit is harvested, the pulp and seeds are removed and fermented. Dried roasted and then powdered and then we have chocolate. This tree is found in the Amazon basin, and is now grown in many areas of the world, it does require a tropical to sub tropical climate and it is grown commercially in Australia. Being an understory tree, that reaches around 5 – 7 metres in height. It is best in the tropical areas and although it is grown to make the chocolate, the sweet pulpy fruit can also be eaten fresh. The fruit is harvested when ripe and this is when it begins to turn yellow. Fruit can take around 6 months to ripen. The fresh seeds will have a purple interior, this chnages to the chocolate brown after fermentation and roasting. 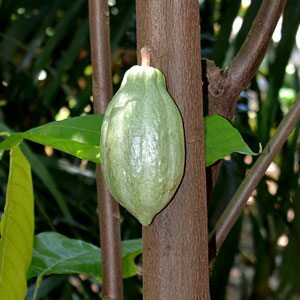 How to grow the Cacao tree. Firstly you do need a tropical climate with good rainfall or access to irrigation. A temperature range at the low end being around 20 C and at the higher end 35C. To grow successfully, you will need to mimic the natural understory growth habit. So taller trees to provide shade or around 80% shade cloth. A fertile humus rich soil is important for good growth, as is good drainage. In cultivation the trees are kept pruned to around 4 metres in height to make harvesting easier. Protection from strong winds essential as the Cacao tree is subject to limb sheer.